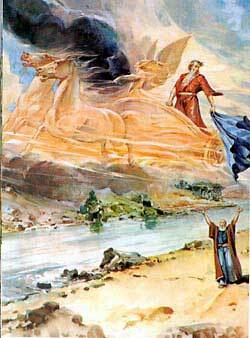 A chariot of fire appears, and Elijah is taken to heaven in a whirlwind. LIJAH RETURNED WITH Ahab to Jezreel, a beautiful place where the king had a palace. But Jezebel threatened to kill the prophet; so he fled for his life out of Israel, into the kingdom of Judah, to Beersheba. There he left his servant, while he himself went a day's journey into the wilderness. Here, weary and worn out with his troubles, he lay down to sleep under a juniper-tree, and begged God to let him die. But while he slept, an angel touched him, bidding him rise and eat; and when he looked, he saw a cake baked on the coals, and a bottle of water by his side. So he ate and drank, and then lay down again. A second time the angel touched him, and bade him rise and eat; and that food which God had sent him sustained him for forty days and nights, while he traveled through the wilderness to Mount Horeb. And there, after storm, and earthquake, and fire, God appeared to him in a wonderful manner. At length the time came when God would take Elijah to heaven without dying like other men. And as he and Elisha,, who was to succeed him as prophet, went on their way from Gilgal to the River Jordan, Elijah, knowing what God was about to do for him, tried to persuade Elisha to leave him to go on alone. But Elisha clung lovingly to his master, and would not leave him. Then, at Bethel and Jericho, scholars of the prophets, who lived there, came out to them, asking Elisha if he knew that God would that day take away his master from him. Elisha answered them, "Yea, I know it;" and again Elijah would have sent him away, but he would not go. So they traveled together till they reached the river, where Elijah wrapped his mantle together, struck the waters, and they were divided, standing on each hand, so that he and Elisha passed over on dry ground. And as they still went on, suddenly there appeared in the air a chariot of fire, with horses of fire, which, parting the two asunder, carried up Elijah in a whirlwind to heaven. And when Elisha saw it, he cried after him, "My father, my father, the chariots of Israel, and the horsemen thereof!" Then he took the mantle that fell from Elijah as he went up, and turned back to the Jordan; and as he stood on its bank,, he struck the waters, exclaiming, "Where is the Lord God of Elijah?" Then the waters were divided as they had been before and Elisha went over on dry land.